In this article I will share my personal experience on how to build a Magento 2 Module outside of Magento 2 app/code directory. Having Magento 2 module in a separate repository might be useful in case you are planning to share it later with the community or sell it from Magento Marketplace. Other than that, the benefit is vital when it comes to project history. There are only module-related commits in your module repository. 3. copy and paste Module related files manually (Ctrl+C, Ctrl+V). This might be a joke, however someone is doing it this way as well. This option comes first when I think about developing some stuff using GIT. A submodule command allows you to keep another Git repository in a subdirectory of your repository. As a result new magento-2-test-module directory is created inside /var/www/magento2/ project. My article is about different approach which I really enjoy to use. My attention came to one of community scripts for Magento 1 called modman. This is a bash script used to clone a repository where you store Magento Module into .modman directory. Once repository is cloned into .modman directory the modman script creates symlinks inside app/code/ Magento directory. Actually, you can configure modman to symlink module’s repository to any directory. Later in this article I will show how to do it. The modman has been created by Colin Mollenhour (Twitter: @colinmollenhour), one of well known Magento community members. The script helps me to develop my personal Magento 2 modules on day-to-day basis. Also, you can use modman to add a folder/project which is stored on your local computer to a Magento 2 project. I think this is a modman manager’s killer-feature. In addition to this, it allows to have more than 1 repository. Ability to manage multiple Magento 2 Modules and check status of your changes for all connected repositories with simple modman status command enables developers to forget about routine repository management. The git submodule command does not allow to have such flexibility. You can find script and detailed tutorial by navigating to the https://github.com/colinmollenhour/modman page. Before we start let’s create new GIT repository. The magento-2-test-module repository will contain our Test Magento 2 module. In this article we are going to have Magento 2 basic module. The module can only register itself in Modules pool during Magento 2 application installation. 3. 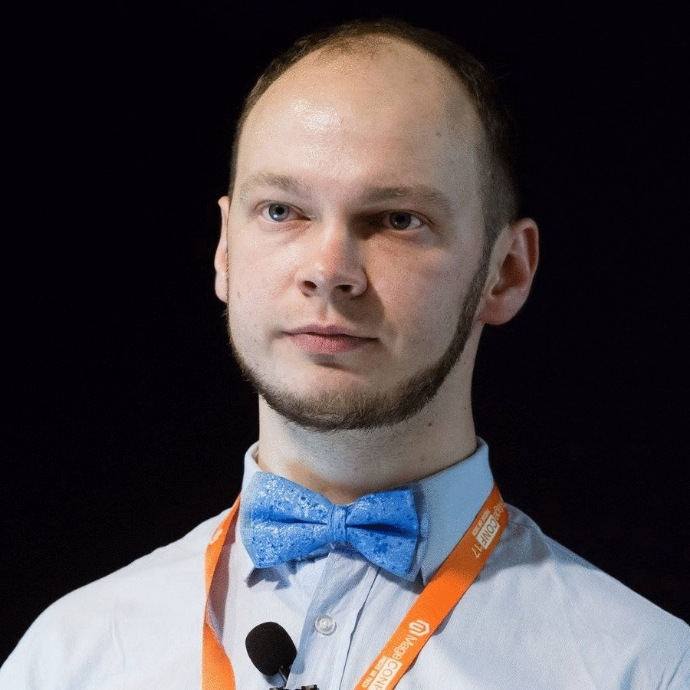 The composer.json where project “type” should be set to “magento2-module”. I recommend to also check PHP Developers Guide to get more insights on how to develop and extend Magento functionality. $ git commit -m "Basic Magento 2 test module"
Receiving objects: 100% (12/12), done. The Pronko_Magento2TestModule Magento 2 Module has been successfully added. During Magento installation the Pronko_Magento2TestModule module should be available under Step #4: Customise Your Store under Advances Modules Configurations section. It is recommended to create new files under /.modman/magento-2-test-module directory. It will help to avoid issues when part of your module has symlinks and another part has files. I have found it easy to modify symlink files under /app/code/Pronko/Magento2TestModule directory once files are created in the /.modman/magento-2-test-module directory. 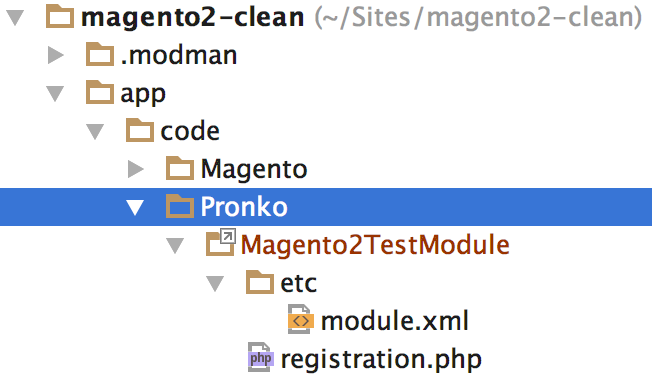 You may prefer to develop directly in the /.modman/magento-2-test-module directory as well. Your branch is up-to-date with 'origin/2.0'. We can even add these 2 directories to the .gitignore file to avoid confusion. $ git commit -m "New Customer Plugin"
Writing objects: 100% (5/5), 500 bytes | 0 bytes/s, done. Don’t be confused with Magento 2 repository. There are no changes committed. Only the magento-2-test-module repository has been updated. In this article we have reviewed 2 ways of adding Module which is stored in a separate repository to Magento 2 project for and continue testing and developing inside Module. For this purposes there are git submodule command can be used. It is less likely something I can recommend. I use modman Module Manager created by Colin Mollenhour which is simple bash script and streight forward to use. It also allows you to manage multiple Modules at a same time. Follow me @max_pronko on Twitter. I will post more stuff and update you once it is available.